These marinated beef kabobs go by several names: kabobs, shish kabobs, kebabs or simply grilled beef skewers. Whatever you call them, this recipe for marinated and grilled beef is really delicious. Grilling beef is the perfect way to prepare it in the summer. This will quickly become one of your favorite summer recipes. Trim the fat from the steak and cut it into 1 1/2 inch cubes. Place the meat in a shallow, non metallic container. Combine the salad dressing, lemon juice, Worcestershire sauce, pepper and garlic powder and pour the mixture over the meat. Cover and marinate in the refrigerator for 8 hours. If you are using wooden skewers soak them for an hour before using so they don't burn. Drain the meat, reserving the marinade in a bowl. If using the bacon, wrap it around the meat and secure with a toothpick. Alternate the meat and vegetables on 4 skewers or more if you have short skewers. Grill the kabobs over medium hot coals for 15 minutes or until the desired degree of doneness While they are cooking, turn and baste the kabobs frequently with the reserved marinade. You can use many different salad dressings instead of the Russian. Catalina works really well because it has a bit of sweetness. Italian dressing is delicious too, but obviously a less sweet taste. If you need this recipe to be gluten free make sure your dressing has no gluten. A homemade salad dressing would be best. A mix of colored peppers looks great on the plate. You are using red tomatoes, so try a mix of green and yellow peppers. Food that looks good has more appeal. If you don’t have cherry or grape tomatoes, cut the tomatoes into wedges and skewer them. The wonderful carmelization and smokiness from the barbecue is a perfect combination for any meat, and works especially well for beef. You can also make this recipe using pork or chicken. Any of those meats would take well to the Russian salad dressing. 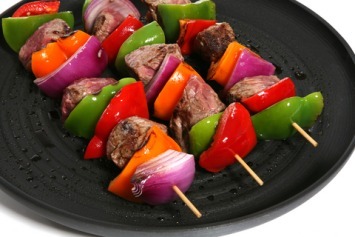 Beef kabobs are a good diabetes low carb recipe. Lean protein and low carbs – combine with lots of healthy vegetables and it is a wonderful diabetic recipe. For use as a diabetic recipe, use a vinaigrette or salad dressing with no sugar. If you prefer, you can replace the Russian dressing with an easy homemade Italian garlic vinaigrette. It would be delicious with any of those meats as well. Want to serve a variety of meats at your barbecue alongside your beef kabobs? Have a look at our delicious recipe for hamburgers.